First, double check to make sure that a sound is actually assigned to that pad. Click “KIT” (in your “MODE” section) then “EDIT” (First “FUNCTION KEY” below the mode section) and make sure that something shows up in the “SAMPLE” window. Make sure your audio interface is selected in the “Systems Settings” menu (click “SYSTEM”, which is the third “FUNCTION KEY” from the right on your BTV Solo interface). If you don’t have an audio interface make sure you select “built in” For Audio Input and Output. Otherwise, select your interface. PC – Make sure you have downloaded asio4all (www.asio4all.com) Install it, then restart your computer. Select that for your output in the “Systems Settings”. If your CPU usage is high it can cause the clicks and pops. Heavy FX are known to intensify this in any DAW (Digital Audio Workstation). Increasing the buffer size is one way to compensate. To increase your buffer size click “SYSTEM, and in your system settings you’ll see “Buffer Size”. Click the drop down to increase the value. If it’s still an issue, disabling devices like ethernet, and wireless controllers (at least while recording) can help to free up system resources. Make sure its plugged in before you start BTV Solo. Then click the “SYSTEM” button and Make sure “OMNI” is selected. *NOTE* To use a MIDI controller to trigger samples, you might need to have the controller on and available before launching BTV Solo. If BTV Solo does not find any devices on launching, then shut it down, check all connections and re-launch. SAMPLE – A digital recording of a sound. This software ships with a library of over 3000 samples. You can also create your own and store them in a user location. PAD – One of the 13 pentagonal shapes located at the bottom of the BTV software screen. These represent physical drum triggers. 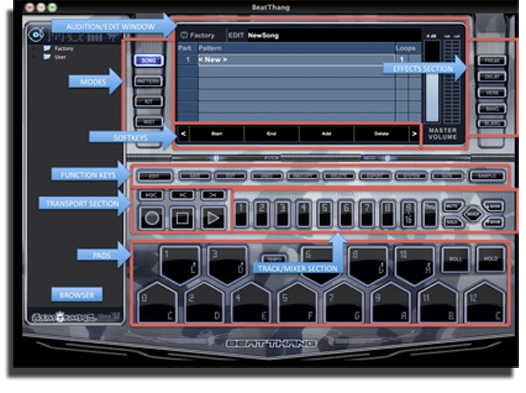 Sounds are assigned to them and can be triggered using your computer keyboard, controller device, or through MIDI. BANK – This is a group of 12 pads (or 1 octave). There are 8 banks total in every kit. (96 sounds total per kit). Use BANK up and down buttons to access banks. KIT – A collection of samples. By organizing samples into Kits, you can easily access several samples simultaneously. You can also assign multiple samples (up to 16) to a single Pad for a layered sound. INSTRUMENT – A sound that is pitched across all or part of the eight octave (8 bank) key range. TRACK – A discrete location that can have a different Kit or Instrument assigned to it. 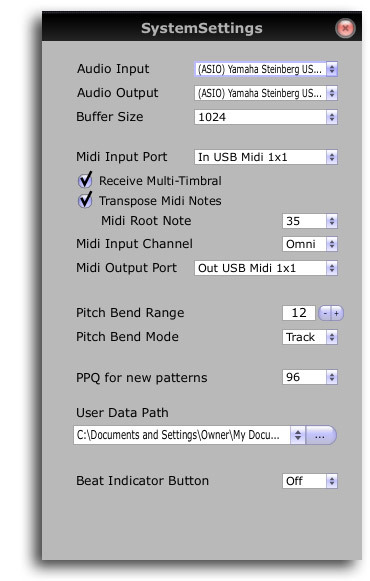 There are 8 internal tracks and 8 external (for sequencing other MIDI instruments). Tracks are accessed by pressing buttons 1-8. Tracks 9-16 are accessed by pressing the 9/16 button, and then 1-8 buttons respectively. PATTERN – A looped beat composed using various Kits and Instruments assigned to multiple Tracks. SONG – A string of patterns. In the Song mode, patterns may be chained together to create arrangements that are saved as songs.